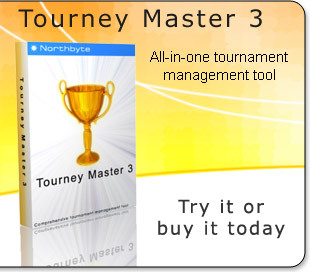 Tourney Master 3 is powerful tournament software with rich set of features that allows you to easily generate tournament brackets, schedule game times, seed the teams, print or export tournament brackets and reports to HTML for publishing online. Our software can be used for most of sports including baseball, softball, chess, basketball, football, foosball, hockey, soccer, volleyball, martial arts, cybersport, curling and many other ones. Create multiple tournament events with unlimited number of players or teams. Our tournament software allows you to manage tournaments virtually of any format. Tourney Master 3 supports elimination events that utilize Single Elimination and Double Elimination, it supports Round Robin and its variation Pool Play as well as any mixed formats like Pool to Bracket Play, Consolation and 2-game guarantee, 3-game guarantee and 4-game guarantee. Moreover, you can set particular series and game parameters for each round in an event. With our sport software, you can organize events as stages of the tournament, constructing any tournament structure you want. 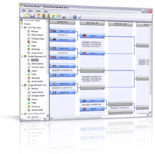 Tourney Master 3 includes powerful tournament scheduler which makes all hard and time consuming scheduling fast and easy. Just add dates, times and location availability and the program will do the rest. You can select which games are to be scheduled, selecting them by round or status. When the scheduling is complete you can adjust game times and locations with the convenient schedule management tools in the manual or semi-automatic mode. The program automatically seeds teams or players in the way you want. Use the Random seeding if you want the bracket to be filled in a random way. Use the Advantage seeding if you want specific teams or players face each other in the latest round possible. Use the Random by Groups seeding if you don't want teams or players from the same city or club to play the first match in the tournament with their team-mates. After the tournament has been created, you can easily manage it with the well-engineered user interface. The three views: the Bracket, the Series/Games and the Schedule allow you to find, add or change game data in seconds. Print you brackets and reports on the paper of any size. The program is able to print even very large (wallboard size) tournament brackets. Export your tournament bracket to HTML for publishing online. Customize visual appearance of the brackets and reports - select appropriate graphical theme (skin) or create a new one. Select your sport terminology for the tournament: you can choose from the existing sport templates or create a new one. You can select an icon for each team or player that will be displayed in the brackets and reports. Select from existing icon sets (country flags and sport icons) or create your own icon set. The tournament software has multilingual user interface and it can be translated virtually to any language. Refer to the support if you are interested in having the Tourney Master translated to your native language. If you have suggestions or propositions, make a request to support team. © 2007-2017 Northbyte. All rights reserved.